It is the time of the year for our yearly family tradition, Visita Iglesia. I love visiting Churches especially if it is my first time. As the elders said, you can make a wish for anything, if it is your first time to visit a church. Imagine if you have 7 or more churches to visit, it means more wishes to come or it can have a huge chance that it will come true for wishing the same thing. Moreover, holy week is for remembering Christ suffering on earth for all of us so repent and be save! We should always be sorry for your sins. Don't forget to thank God for all the blessings you have been receiving. God is good, all the time! Let's get going, shall we? I grew up with this church because before moving to Manila, I went to the school besides this church. We always walk, run and play around the vicinity. Childhood days. Oh, how I miss to have fun and to be carefree just like a kid again. Inside St. Magdalene Parish Church - The altar has the golden touch. Inside San Gregorio Magno Parish Church - the interior is so majestic. Our last stop, we spent our few hours here at St. Vincent Ferrer Parish Chruch. We were just in time for the mass and for the washing of the feet. Most of the time we usually end our visita iglesia with a mass. For everyone, just a bit of advise, start it early and bring some prayer books for the station of the cross. In addition, pack some food or snacks and jug of water just in case anyone got hungry and thirsty. 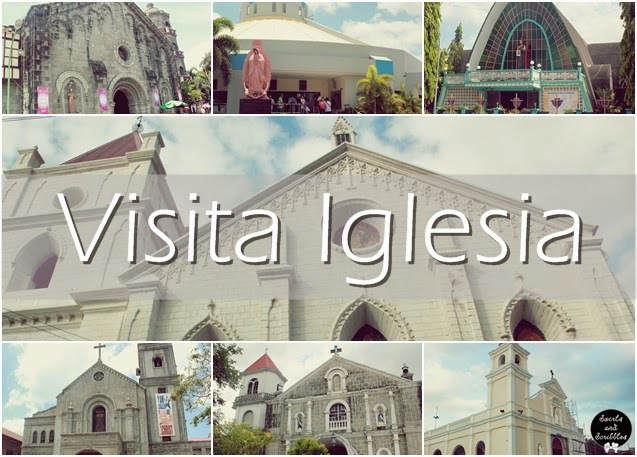 Plan your Visita Iglesia ahead and avoid the crowded place! I hope you enjoyed reading my post. How about you? What's your tradition during holy week?